The thrill of playing online casino slots consists in that drawing possibility of hitting a huge jackpot from a small wager. The excitement of going to Las Vegas is to get a roll of dimes or quarters and try to hit a life-changing jackpot. We have amongst our large collection of online slots, a few games with very high variance or high risk, which enable the player to win seriously big amounts from a relatively small wager. 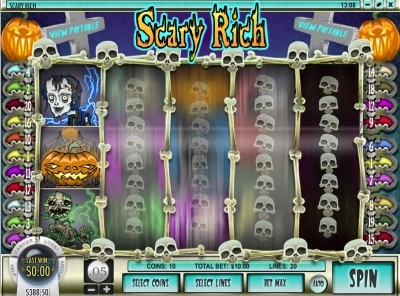 These games are called that, high variance slot machines, because they have very unpredictable payout patterns. Normally they will give very modest jackpots during your play and then suddenly during a bonus round or free spin, a huge jackpot will come that will cover all previous losses and still leave a large margin of profit. 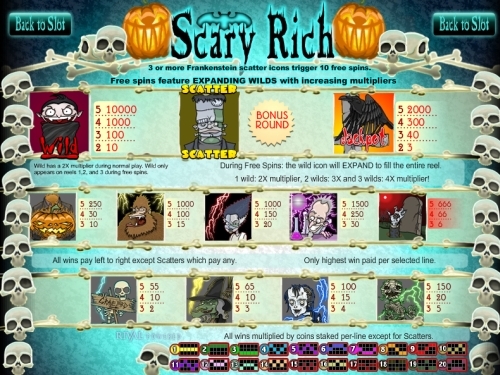 Simply complete at least $5 in wagers on Scary Rich (part one) this week. Then on Monday Feb. 22nd we will double that and award you with $10 Free at the cashier. The Free casino bonus will be released and awarded at your cashier during the morning hours of next Monday. Think you can guess from what famous movie the following audio clip was taken? Visit our Movie Trivia page and get a chance to win another $10 FREE. Hint: this movie was a blockbuster hit and is one with the highest box office revenues in history. Stay tune for more free casino tips, online casino contests, movie trivia and free casino bonuses every week, only at Superior Casino! « Loose slot machines online this month at Superior Casino!